OK, this is pursuant to a discussion I've recently had on an art forum regarding modeling sculptures from unsatisfactorily lit references. It's always best to draw from the object directly (i.e, 'live'), but often times all we have is a pictorial reference. However, if even that is not suitably lit (which means that the dominant light is preferably angling down from the side, in front, along with a soft reflected glow on the shadow side) and the shadows are scattered all over, the outcome is often flat. In that case, one really needs to 'invent' a dominant light, and suppress the other sources. In this exercise, I've downplayed the other two lights in the ref - one coming from the front, and the one coming over his left shoulder. The main band of terminator or core shadow thus passes down the face, with his right side most well-lit. Mind you, this was really intended to be an 'example sketch' of sorts, to emphasize on certain points. In that respect, it is hardly a proper, patient study... took me about 2-2.30 hrs more or less. Preliminary sketch in conte. After establishing the basic shape of the head, and putting in the facial features in proper relationship to each other, I was marking out the broad shadow areas. These I'll be filling in, in the subsequent w.i.p. After filling in or 'blocking' the basic shadow shapes, giving predominance to the light coming in over his right shoulder, I had used a moistened brush to 'push' the dark pigment from the shadows into the white areas. I preserved paper-white in the highlights only. You can see this effect on his right, forehead area... those faint brush marks. Here I've used some yellow ocher watersoluble pencil for the background. So as to better integrate the BG with the head, I have also introduced some of this BG color (as reflected light) on the bust itself. In the next/final stage (which is same as the pic posted at the top of this thread) I'll be adding more details. Here I've basically darkened certain areas in preference over others e.g. the eyes, the mouth etc., smoothened out the transitions between the variously illuminated areas a bit, and over-all... worked on the 'turning shadows' or terminator shadows (darker area between two illuminated zones) to give the form greater dimensionality. Actually this was the easiest part - work-wise, but I had to be careful so as not to 'equally blacken up' all areas. Since the illumination in the ref was scattered/indefinite... 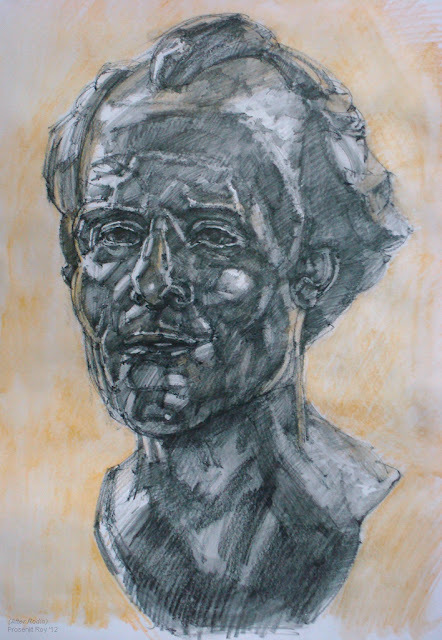 I had to ensure that the bust doesn't end up appearing flat, hence some careful contrast work. Haha... which means I've lived true to my reputation as Babble king :D Thank you, thank you! Hey Sandra, your encouragement and visits to this blog are sincerely appreciated :) Btw, wetcanvas has finally done it, disconnected/logged me out (and I guess scores of other members as well) with their latest server shift. So if I can't log in and respond to my new thread in Figure, you'd know whom to blame, lol!